okay, for the next in my series of “I was there” photos. These relate to scenes in The Lost Queen. 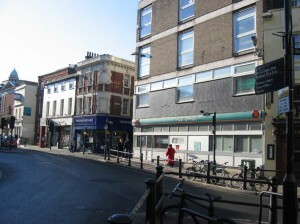 this is the Post Office in Richmond where Tania and Edric tried to discover who had sent Tania her Soul Book. 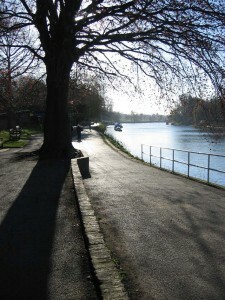 Here’s the riverside walkway where Tania met her other self “Gracie” with Nanny Perks. 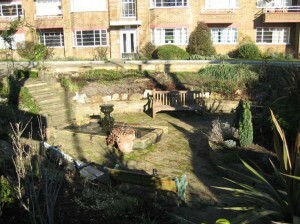 And the next picture is of the gardens that front the apartment where Titania was living - with the block of apartments in the background. The riverside looks exactly as I had pictured it! AFJ. A photo gallery…yes…I was thinking about that wasn’t I? I’ll check that out - thanks for reminding me, Daniela. That’s so cool! I think its awesome how alot of your story is based on actual places, yet at the same time you’re able to give the descriptions such a mystical feel. =) Great photography, by the way. I’m home and going to be getting back to work on the fansite and forum as soon as I can. Our internet was cut off while we were gone so I’m sharing a wifi card with my mom (AKA biggest internet hog ever) until its fixed, but it shouldn’t be long. I love the photos. Will there be a seven book of the faerie path series? Gracie? O_o How come I don’t remember Gracie…seems familiar…but I just cant seem to place it in my mind. Amy - maybe someone could remind Amy of exactly who Gracie was…? Is Gracie the one who died of the really bad sickness? the one where in her flash back they went to a theater and they werent suppose to or something? No!! Gracie was the one who was mad at the replacement of Nanny Bobbins and drowned in the river after slipping on a stone and turning her ankle. wasnt gracie the one who drowned? Gracie is the one little girl that fell into the river as her nanny was calling for her,right? Why didnt Tania’s other selfs look like her faerie self like “anita” did, with the red hair and all? what would have happened if 1 of the others did live long enough to reawaken her faerie self?she’d look totally diffrent then her original faerie self! ooooooh ok i rember now! AFJ. Mandy - there’s an explanation of your questions in book 6. I’m working on the photo gallery thing - and I’ll post the pix as soon as its up and running. I’m DYING to know more about the sixth book! Can you post the first chapter or something? AFJ. Sorry Rachel - I can’t do that yet. I don’t have the final agreement with the Publishers about the exact text, and they are really fussy about that. It shouldn’t be too long, though. Meanwhile, i might post some photos of places in London that I looked at when I was putting the story together. AFJ. Daniela - I think you’re right! What are the Mystic arts powers in the story? Does the fairy queen have the same powers as her husband does? AFJ. Good question - would any of you people like to give an answer? AFJ. Hey! I just noticed that if you go to Wikipedia and type The Faerie Path in search - you get info about the series and the characters. Your questions might even get answered there Br - check it out if you have time.